Faith Hill has made country music history by becoming the first female in the genre to sell multi-platinum copies of both her debut and her sophomore albums. That kind of pressure must be astounding. Perhaps it is why her newest album pales in comparison to her earlier efforts. 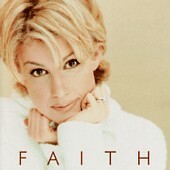 Faith begins with the first single, "This Kiss." At the time of its release, I wondered why such a weak song was being sent to radio. After listening to the entire album, I now know that her label had very little choice, as it was one of the stronger songs in the collection. Its cute, harmless, and pointless lyric backed with an infectious beat is typical of the album's songs. "You Give Me Love," and "The Hard Way" both fall under that category. Similarly, the second single from the album, "Just To Hear You Say That You Love Me," reflects the mushy lightness of most Faith's ballads. This could not be a Faith Hill album without the mandatory remake. She took on Janis Joplin on her first album, Alan Jackson on her second album, and now she takes on ... Celine Dion. Faith doesn't choose some obscure little Celine song either. Rather, she chooses "I Love You," a song from Celine's hugely successful "Falling Into You" CD. Actually, that is only one of three covers. "Just to Hear You Say That You Love Me" was originally recorded by Chynna Phillips on her "Naked and Sacred" CD and "Better Days" was originally recorded by Bekka Bramlett and Billy Burnette on their "Bekka And Billy" CD. If you are planning on buying this album to hear the country handling of Chynna and Celine's songs, don't bother. The newer versions are nearly identical to the original. In the case of "I Love You," it sounds almost as if they simply deleted Celine's voice and added Faith's. Faith does, of course, her best Celine impersonation, but she still falls short. "Better Days" is saved by Bekka Bramlett's amazing harmony vocal. Perhaps Faith should have asked Celine to come sing on the CD, it would have added some missing spark. Celine certainly would have been in good company, with all the celebrity vocal guests appearing on "Faith." Besides Bekka, Vince Gill sings on the seventies styled "Let Me Let Go;" husband Tim McGraw sings on Faith's horrid rendition of "Just to Say that You Love Me," and Sheryl Crow co-wrote the album's closer, "Somebody Stand By Me." In the later, Faith begs "won't somebody stand by me just one time, oh, won't somebody stand by me?" It may be what she is moaning to her previous fans in a couple years if she continues to put out albums as bad as this one.